Fourty-seven of these locomotives were built by the Birmingham Railway Carriage & Wagon Company (BRCW). BRCW also built the similar Class 27 and Class 33 locomotives. The class 26s had 1160hp 6LDA28 Sulzer engines and Crompton Parkinson electrical equipment. The first 20 locos ordered in 1955 as part of the Modernisation plan diesel loco 'Pilot Scheme', were soon followed by another order for twenty seven more. Loco's D5300-19 were delivered new to the Eastern Region from July 1958 and worked suburban trains from London King's Cross. D5303 was borrowed for trials in Scotland, working 10:12 Waverley - Perth on 29th October and 1st November then being employed over the Waverley route later in November 1958. Loco's D5320-46 were for the Scottish region, delivered between April and November 1959, although D5330-35 were initially loaned to the Eastern. By the end of 1960, all 47 locos were in Scotland, with most of the first batch at Haymarket Depot (64B) and the second batch at Inverness (60A). As built, the second batch differed in a number of details, most obviously the drivers cabsides had T-shaped recesses for 'tablet catchers'. The weight was also reduced by 5 tonnes. During 1966-67, the first seven loco's (D5300-06) were converted for use on Merry-Go-Round coal trains serving Cockenzie power station. These locos had their steam heating equipment removed, and were fitted with air brakes and slow-speed control. In 1975, reallocations saw Inverness exchange its class 24s for class 26s from Haymarket. From 1978 Inverness gained an allocation of Class 47s which replaced pairs of 26s on the Inverness-Edinburgh/Glasgow trains, and 1982 saw class 37s introduced on to the Far North and Kyle lines. However Class 26s continued to see use on both the North highland routes until RETB signalling was introduced. Thirty-three of the class survived to be given 'Heavy General Repairs' during the 1980s. This included a tidy up of the cab fronts, removal of steam heating equipment, and fitting of air-brakes. By the end of 1985, 26038 was the last of the class to retain steam heating, and 26026 was the last to be fitted with air-brakes, outshopped in July 1986. The class was now regarded as freight-only, although occasional use on passenger trains continued to occur through to the early 1990s, during shortages of DMUs or other locos. By then end of 1986 the whole class was based at Haymarket. May 1987 saw 26 of the class transferred from Haymarket to Eastfield, with the 7 MGR locos following in May 1988. Most of the class's booked freight duties came to an end in 1991 when the 'Speedlink' wagonload service was abandoned and the MGR fleet was displaced by larger locos. However the 26s were still usefully employed on engineering trains. 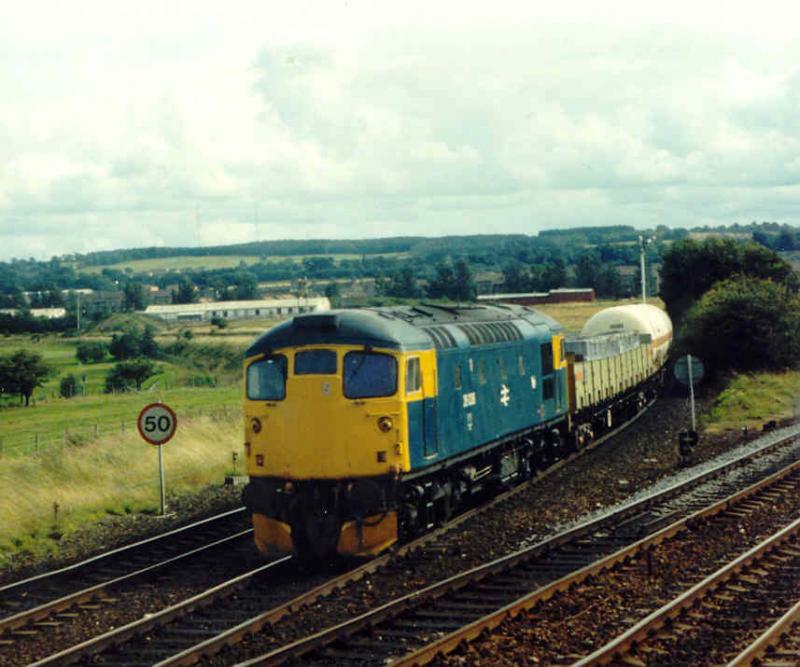 With the closure of Eastfield, remaining locos were reallocated to Inverness Depot in August 1992. Ten locos had been withdrawn between 1988-1991, but the rundown of the class accelerated with 12 locos withdrawn towards the end of 1992 as class 37s became available as replacements. The summer of 1993 saw a booked passenger turn for 26001+007 from Inverness to Kyle and back on Wednesdays. 13 class 26 locos have been saved for preservation, with several based in Scotland. Created by Dysgraphyk and last modified by MacRat at 09:21, 28 of May 2010.